Our bespoke online legionella awareness training is now up and running. It is available for anyone who has an interest in legionella awareness. This course is aimed at anyone who has any dealings with legionella control or monitoring, from the client/responsible person, to the monitoring engineer. The online course lasts for just under one hour. It is made up of several modules with a multiple choice test at the end of each module. 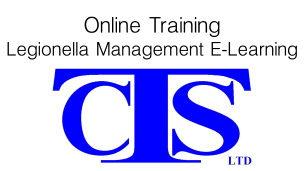 Once all modules have been completed successfully the user will be issued with a CTS branded certificate of legionella awareness. We have accredited this course as members of the Legionella Control Association. A demo of the course can be viewed and you can register interest for the course by clicking HERE. This link also has a section for registering your interest in this legionella awareness video, or you can use this website to CONTACT US directly through this website.